A new competition taking place just after our AVC! 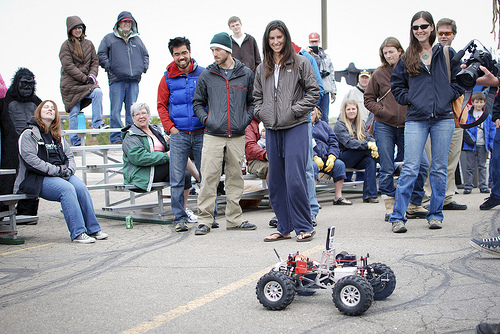 As you may have heard, next Saturday (June 16, 2012) is the fourth annual SparkFun Autonomous Vehicle Competition (or AVC). This competition has become kind of our signature event where we invite folks from all over the country/world to compete in a robotics contest held right here at SparkFun HQ in sunny Boulder, Colo. This year is shaping up to be a great one! In the past, we have allowed just about any kind of small autonomous vehicle, including quadcopters. While we still adhere to the "Safety Third" line of thinking, we made the decision to not open the event to quads this year. We love them, but we've had some close calls. But we have good news! Our friends over at DIY Drones (led by Chris Anderson of Wired Magazine) are holding a "Multicopter Rodeo" the day following AVC. The event will take place at 10:00 am on Sunday, June 17 at this location, which is about 15 minutes from Sparkfun. Autonomous multicopters and helicopters of all types are welcome, and the competition will consist of timed completion of a course, with extra points for autonomous takeoff and landing within a marked area. Prizes and refreshments will be provided, but mostly it's an opportunity to geek out with other aerial robotics fans and tune code for optimal performance. Low stress, high fun -- everyone welcome (and free!). So there you have it! We hope to see you at AVC (and the following day at the Multicopter Rodeo). If you plan on attending the SparkFun AVC as a spectator, please register for spectator ticket (it's free!). See you then! wow! who is the hottie in the middle with the north face jacket, sweat pants, and flip-flops? Forget her! Who's the hunk in the gorilla suit!! Will there be a live feed of the day? I won't be there on the day. Only if you like to eat bananas. There will be a live feed of the AVC from SparkFun on Saturday. Based on its location, I suspect there won't be live video from the 'Copter Rodeo on Sunday, but I'd love to be proven wrong. We'll definitely have roundup reports of both events. Thanks for your fast reply! Have you made a vehicle for the event? Okay, I have to ask... First picture, all the way on the left. A guy in a gorilla suit? Why? LOL! Looks like it's the 19011. I had seen that video before and knew that there was a gorilla, but just now I asked a colleague to watch the video and count the passes with me. I almost didn't notice the gorilla myself. I might not have if my nine year old colleague had not said, "I can't count daddy, there's a gorilla in the way"! As I recall, his car was a banana. It is Boulder, after all, eh? Is it allowed to bring the quardcopter built by the company? or it has to be DIY. I have one look exactly the same as the one on the pic, controlled by Apple. *Edit: Never mind. Reading comprehension has failed me. 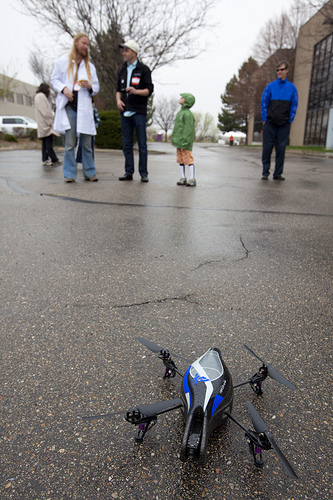 Quadcopters should be allowed at the multicopter rodeo, which Bin Wang is talking about. That's what I get for skimming. Thanks for pointing that out. I thought the first day of summer was June 20th.